A performance proposed by Raimundas Malasauskas entitled ‘2 or 3 things I know about books’, which is based on the famous scene from Jean Luc Godard’s movie of a similar title. Michael Portnoy will be guest performing. 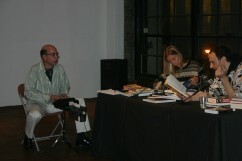 Two readers are seated on a table covered with books, randomly reading sentences and paragraphs from randomly selected books.